If you’ve thought about getting married then chances are you’ve probably heard the term prenuptial agreement thrown around. Many people ignore this important document, thinking that it is something that doesn’t affect them; prenuptial agreements are seen to be the preserve of the rich but this really isn’t the case. In short, this is a legal agreement that sets out how property, assets and finances will be split in the event of a separation. This not only helps to safe guard your existing money and assets, but it also protects any future investments, inheritance and assets that you may acquire. While nobody wants to think about separation before they’ve even tied the knot, signing a prenuptial agreement will give you peace of mind that you’ll have fair divorce court rulings. Anyone who’s been through a divorce before will know how much time and hassle this can save. Do You Have to be Rich for a Prenup? Not at all. One big benefit of having a prenuptial agreement is that it can help to protect the other party against previously accrued debts. Therefore, even if you have absolutely no assets or finances to protect you can use a prenuptial agreement to prevent you from being dragged into a debt that isn’t yours. That said, if you are going into the marriage with assets or finances then it makes sense to sign a prenuptial agreement so that you don’t lose out in the case of a divorce. Even though divorce will be the last thing on your mind at this stage, having an agreement like this arranged through a specialist team of divorce solicitors can help to avoid anxiety and aggravation if the worst does happen – possibly allowing for a more amicable split and preserving some aspects of the relationship. The idea of this agreement simply protecting the wealthier partner is outdated and inaccurate. Prenuptials are more for planning for the future, helping to resolve future potential conflicts at a time when you care about each other the most. This can help to save a lot of time and hassle down the line, meaning that you won’t have to go back and forth to court and between solicitors – a very costly process. You can lay out your assets anyway that you decide, ensuring that it is as fair a split as possible and that neither partner is left worse off if this situation arises. Despite being used extensively in the US and across several European countries for years, the prenup is not legally binding in the UK. However, this type of document can be used as evidence in court in the case of a dispute. In this situation, it will come down to the judge’s ruling although having a prenuptial agreement can help to lead to a favourable decision. 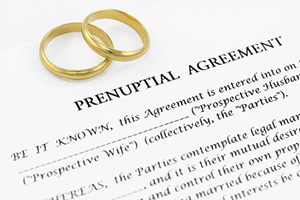 It is not possible to have a prenuptial agreement after you are married, but you can still make this arrangement after you’re married, however this is called a postnuptial agreement. Once both parties have agreed to sign this agreement, you will need to talk to an experienced solicitor about the terms you want included. The solicitor will then be able to guide you through the process from start to finish, writing it up for you both to sign. Each party involved and the solicitor will then keep a copy of this agreement and then you can forget about it unless you need it at a later date.